Next month, Osprey Publishing will be launching a new series of books called Myths and Legends. 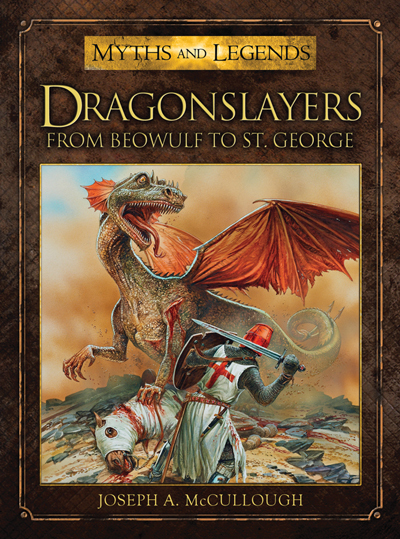 The second book in the series is Dragonslayers: From Beowulf to Saint George, and it just so happens to be written by yours truly. This will be the fifth book of mine to reach publication, and, I can honestly say it is the one of which I am most proud. In preparing this book, I spent almost a year reading and researching through old histories and books of legends. Although I probably had a better than average knowledge of dragon and dragonslaying stories before I started the project, I was astounded to discover just how many stories of dragonslayers exist. While many names in the book such as Sigurd and Hercules, will likely be familiar to fans of fantasy and mythology, I think most people will discover something new. I certainly did when I first read about Dieudonne de Gozon (Draconis Extinctor), Lord Albrecht Trut, and Dobrynya Nikitich. I guess what really makes me proud of this book is that it is a combination of great stories and scholarship. Not only was I able to retell these legends, but I was able to discuss their origins and their place in the greater history of the dragonslayer myth. Oh, and the book has loads of cool artwork, including a bunch of new paintings by Peter Dennis. I’ve just seen the first review of the book here, which is pretty gratifying. J.R.R. Tolkien once said about writing Middle-Earth that he was making the old myths new again. While I would never compare myself to the grand old professor, I think, in writing this book, I was able to find some of the same joy that he did, in hopefully helping to preserve some of these great stories that are starting to slip into obscurity. You can pre-order the book on Amazon now! Or for those in the USA, here. As a little Christmas treat, I bought the new Hobbit box set from Games Workshop and have been slowly painting it up. 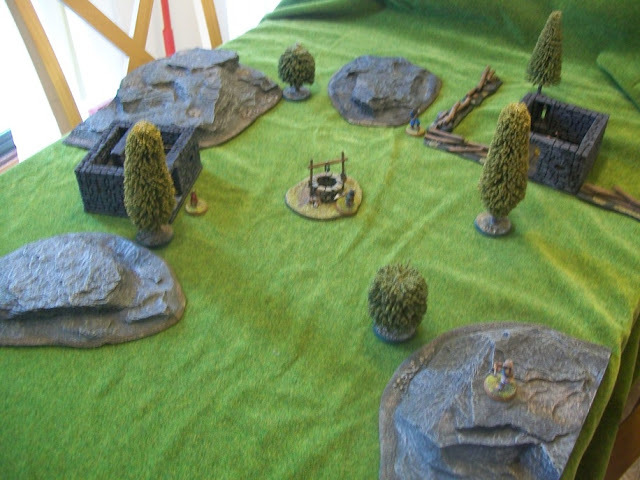 Yesterday, I thought I would gather up my progress so far and have a little skirmish. I’ve only ever played the game a couple of times, so this would be a good test of my knowledge of the rules as well. 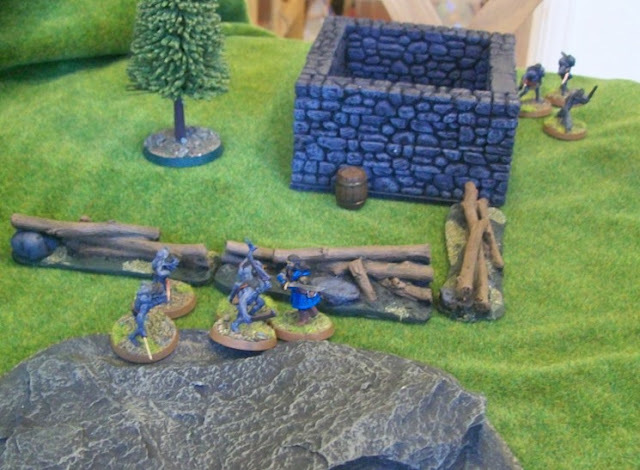 The scenario is set in the foothills of the Misty Mountains, after Thorin and company have encountered the trolls, but before getting into the mountains proper. 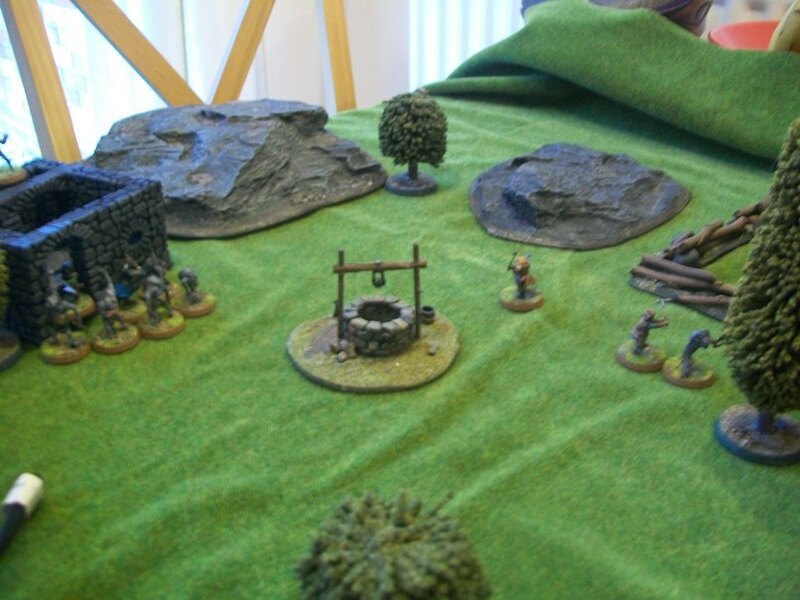 Getting ready to camp for the evening, the Dwarves spy what appears to be an abandoned village or farmstead. While most of the company makes camp, Thorin decides to explore the village, taking along his trusty burglar as well as his companions, Bifor, Bofur and Bombur. Little did Thorin suspect that their movements were being watched. 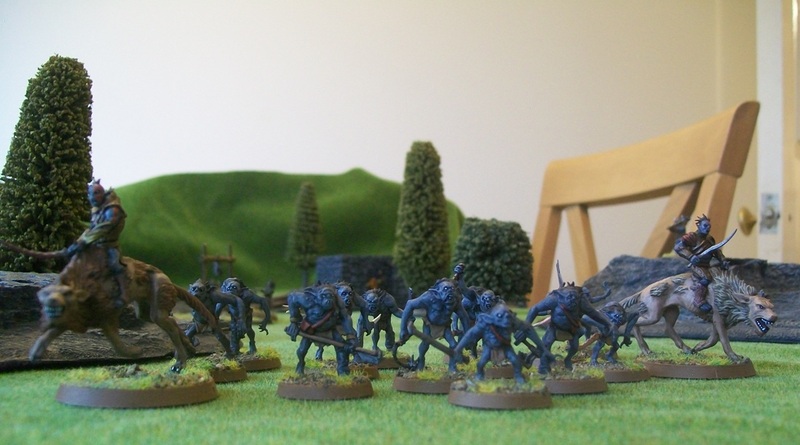 A pack of Goblins, including a Goblin captain, 12 Goblin Warriors, and 2 Orc Warg Riders, were following them. The Dwarves (and Hobbit) split up to search the abandoned buildings, while Bofur climbed a hill to keep watch. 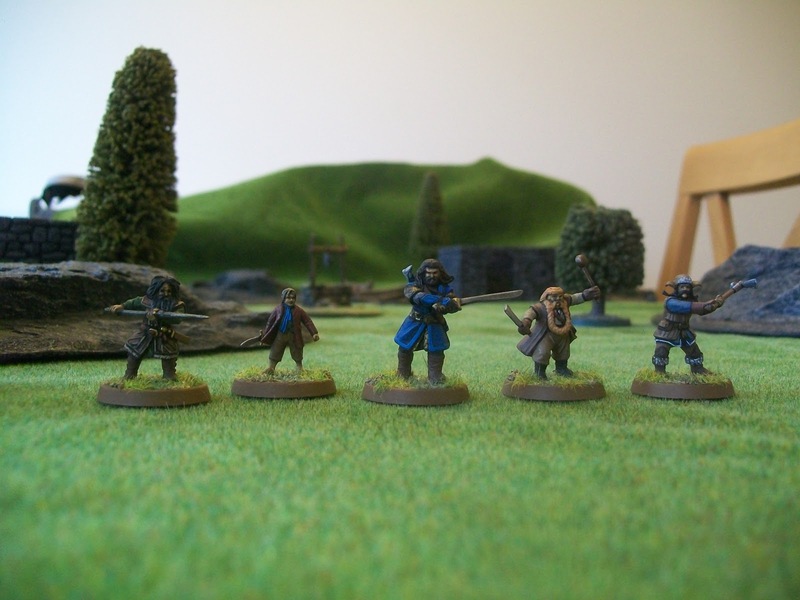 Just as Bofur reached the top, he spied goblins closing in from four different directions and sounded the alarm. Turn 1: Thorin bravely charges the closest group of goblins, but embarrassingly, the goblins get the upper hand and Thorin loses a point of fate. 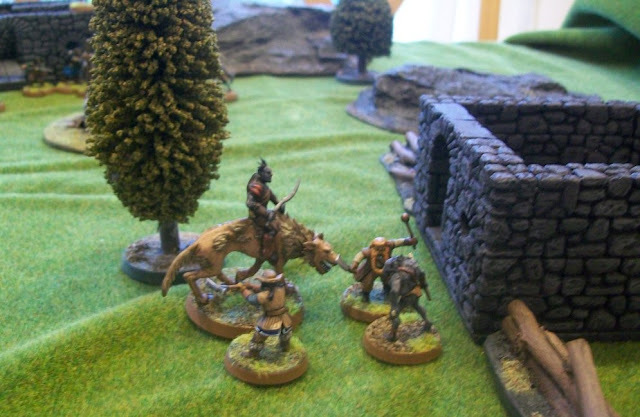 Meanwhile, Bofur slides down the hillside, to join his kinsman Bombur. 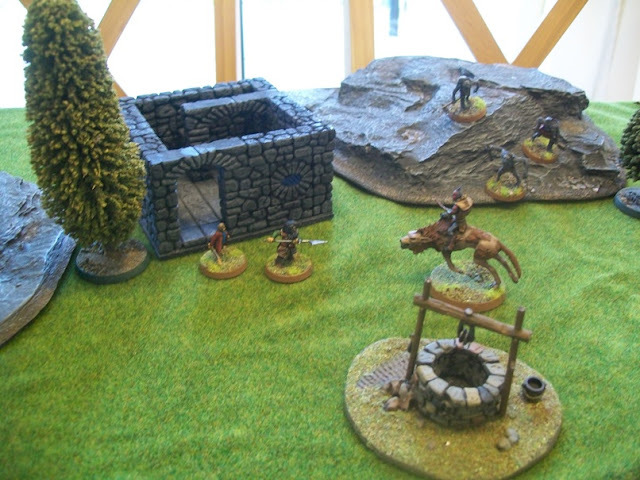 Bifur, seeing a charging warg rider, courageously puts himself between the monster and Bilbo. Turn 2: Bofur and Bombur each dispatch a goblin. Bifur uses a point of might and manages to kill both the warg and its rider. Thorin, attempting to come to the aid of Bifur, is again thrashed by the goblins, costing him his remaining two fate points. 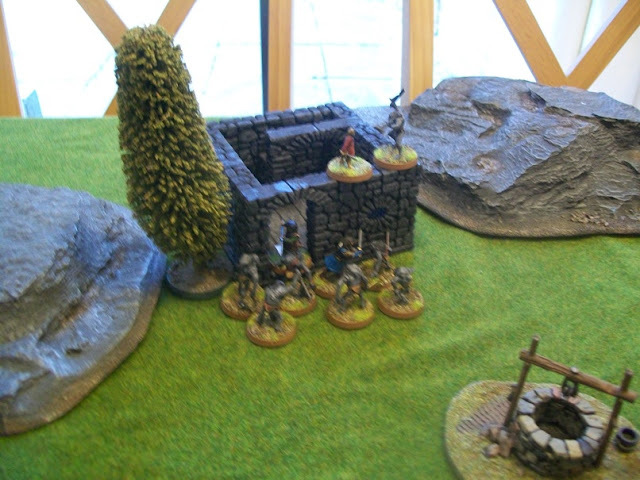 Turn 3: With the goblins having the initiative, Thorin calls a heroic move, for somewhat less than heroic reasons, attempting to reach Bifur as he is now the one who could use a friend. Unfortunately he is jumped by another group of goblins, and for the third turn in a row, Thorin fails to roll higher than a 2 on three dice. Luckily his armour saves him from further damage. 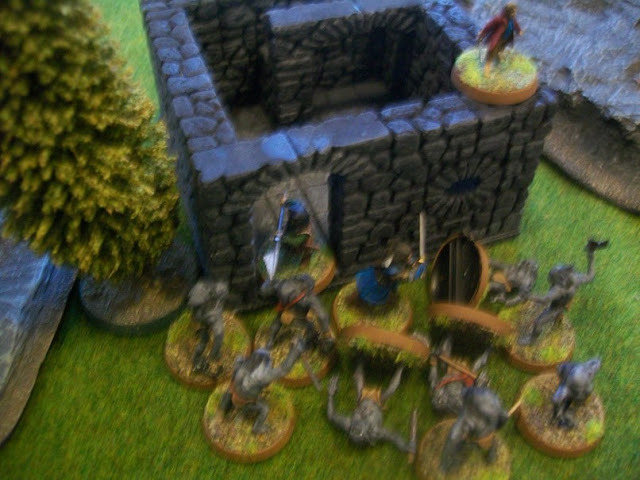 Bifur pushes Bilbo into an abandoned building and guards the door. 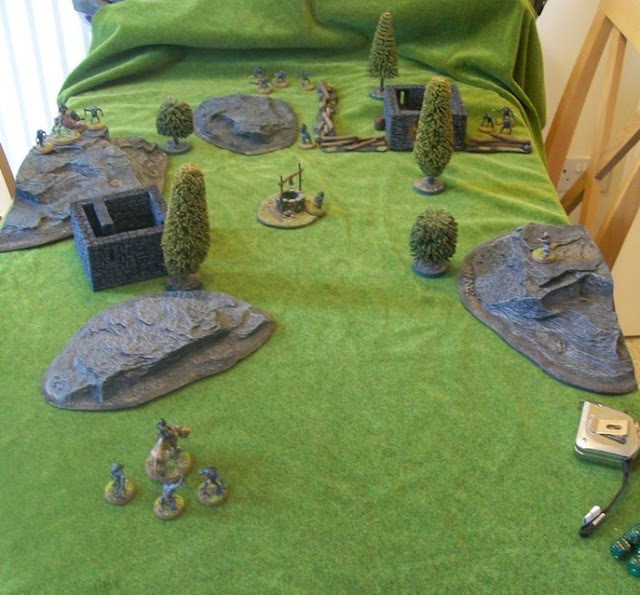 On the other side of the field, Bombur uses a point of might to dispatch another goblin, while Bofur uses two points of might to kill off a warg. Turn 4: The remaining orc takes a vicious cut at Bombur, costing him a fate point and one wound. Thorin finally gets it together, spending one point of might and striking down three goblins. Bilbo climbs up the inside of the building. Turn 5: Bombur takes another wound from the orc, leaving him with just one. Bifur kills a goblin. Thorin looses another fight, but again escapes unharmed. 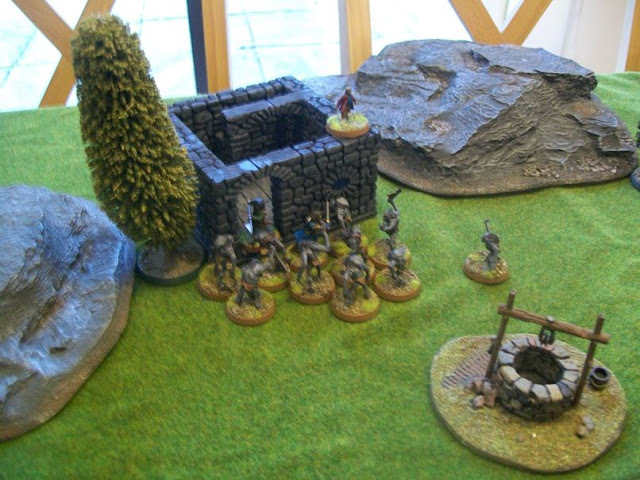 Bilbo throws a rock to no effect as a goblin climbs the wall to get him. Turn 6: The goblin captain joins the fray. Thorin again looses the fight and suffers two wounds, leaving him with only one. 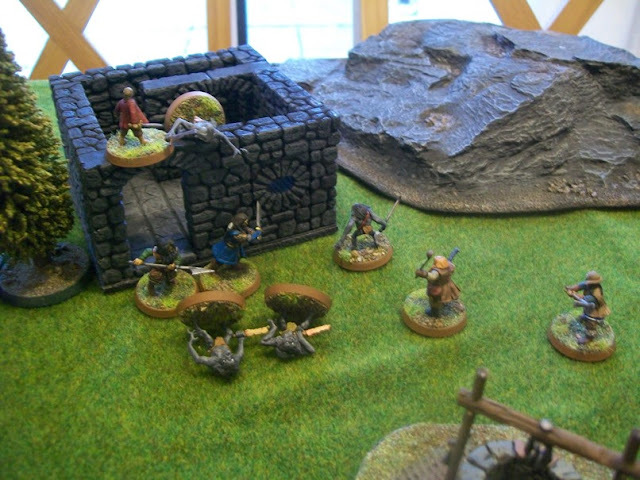 Thankfully, next to him, Bofur uses his boar spear to great effect, taking down two goblins. 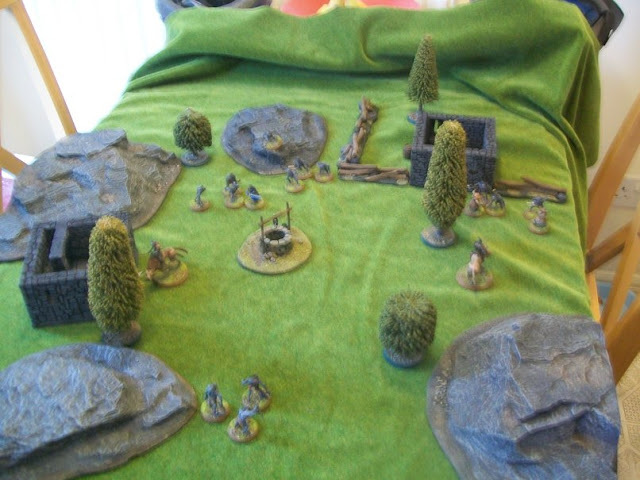 Across the field, Bofur kills the remaining orc, while Bombur rushes to the aid of Thorin. Turn 7: Bilbo spends his only point of might jumping from one side of the building to the other to avoid the goblin. Thorin and Bifur each kill a goblin. Bofur and Bombur run to them. Turn 8: The goblin catches hold of Bilbo, but gets stung by Sting. The goblin captain, realizing he is now on his own, flees into the night. 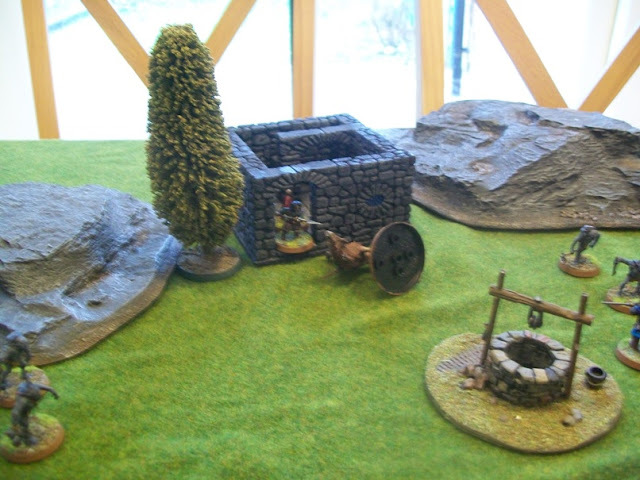 Bifur clearly wins Dwarf of the match, with 6 kills and his brave defence of Bilbo. 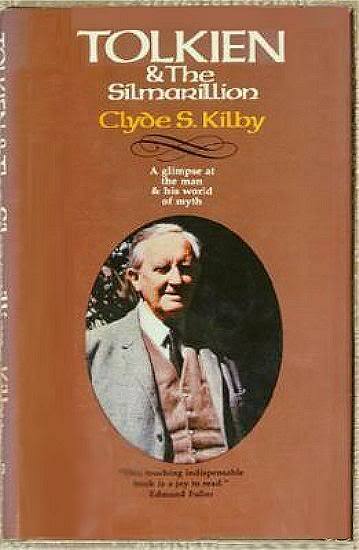 Perhaps the most interesting aspect of Tolkien & The Silmarillion by Clyde S. Kilby is that it was ever published in the first place. A mere 90 pages in length, it is really a collection of Tolkien essays that otherwise have little central theme. The most interesting part of the book is the forty or so pages that Kilby devotes to his long visit with Tolkien in the summer of 1966, when the world was patiently waiting for him to finish work on The Silmarillion. As it turns out, Kilby discovers that Tolkien isn’t really working on The Silmarillion, or much else at that point. Instead, Kilby pens a portrait of an elderly gentleman who is overwhelmed by his popularity, worn out by the legal battles surrounding his works, and too old and tired to complete the giant tasks the world expects of him. The Silmarillion will never be completed, at least in his lifetime, and Tolkien knows this. A few years after Kilby’s visit, J.R.R. Tolkien died. While I fully believe that Clyde S. Kilby wrote this book to honour a man he obviously held as a literary hero, I think it owes its existence almost wholly to the fact that, at that time, The Silmarillion existed only in broken manuscript fragments. The reading public, so desperate for more adventures in Middle-Earth, bought this book in the hopes that they might at least catch another glance at that mythical land. If that is the case, they were likely disappointed. Still, the book went through at least three editions, as it is a third edition copy that I found on my parent’s shelf. I enjoyed reading it, but I wouldn’t advise anyone to purchase it. Although it contains a few interesting glimpses into Tolkien’s character, as a complete work, it belongs to the past, a footnote in the great story of the writings of Middle-Earth. As I believe I’ve mentioned before, The Shadow is my all-time favourite superhero (technically pulp hero). For many years, I collected his original pulp stories through a complex combination of the original, crumbling magazines, paperback reprints, and black-market pirated copies. I was such a big fan that I had my own fanzine, Agents of the Shadow, which ran for twelve issues or so. There was only one problem. I began to realize that many of the original stories weren’t really that good. This isn’t surprising. Most of the over 300 short novels were written by one man (Walter Gibson), who, if legend is to be believed, would often work on multiple novels simultaneously on different typewriters, in order to meet the incredible deadlines of a magazine that was publishing twice a month. Eventually, I drifted away to read better books, but I've never completely let go. 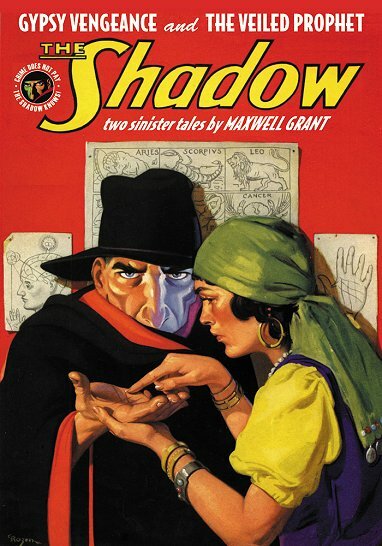 It seems that Walter Gibson did have some magic, and although many of The Shadow novels weren’t great, perhaps together they are more than the sum of their parts. Those novels, combined with their cover artwork, have continued to echo around in my head ever since. Several years ago now, a company called Sanctum Books finally convinced the notoriously hard-nosed magazine publisher Conde Nast (who had inherited the rights to The Shadow Magazine) to let them reprint those old stories. Since then, once a month, they’ve been putting out very nicely done Shadow double-novels in comic-book sized paperbacks. There was a time when I probably would have bought every issue that came out. Time, money, and interest don’t really allow for that now, but I do buy the occasional one, just to check in with my favourite hero. I don’t expect much from them, and occasionally, I’m pleasantly surprised. Such is the case with my most recent reading, The Gypsy Vengeance. The Gypsy Vengeance has a fantastic cover, which can be seen above. I suspect that covers like this had a huge part to play in the success of the magazine (and my own enduring interest in the character). The novel itself starts in a rather traditional Shadow style, with our hero already on the case of a complex crime. The first two-thirds of the book involve the Shadow and his agents (in this case Harry Vincent, Cliff Marsland, and Clyde Burke) trailing the various players in a race to get their hands on some stolen Spanish jewels. Despite the inclusion of a gypsy fortune teller, and an early gunfight with mobsters, it is pretty bland stuff, and at one point the plot hangs by a very tenuous thread. Then, just as I thought it would go down as a completely unremarkable addition to the chronicles of The Shadow, Walter Gibson, worked in a sharp, unexpected, but completely believable twist that saved the day. Once again, my hero used his intelligence and his pistols to triumph over evil and left me smiling in the end.